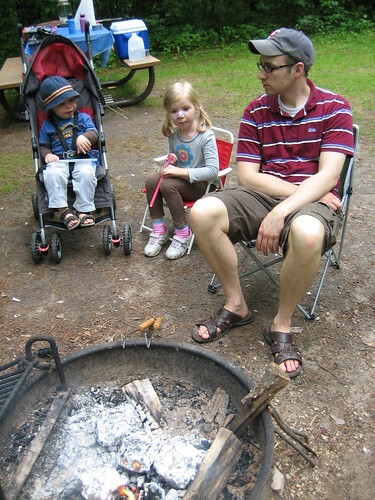 This past weekend, our family went camping together for the first time! 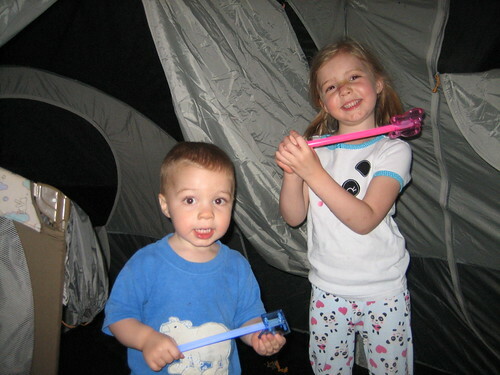 Husband and I used to camp several times a summer before the kids were born, but let me tell you…it’s a different story with littles! My packing list was 3 pages of 2 columns typed! My husband thought that was nuts, but I don’t feel like we over-packed. 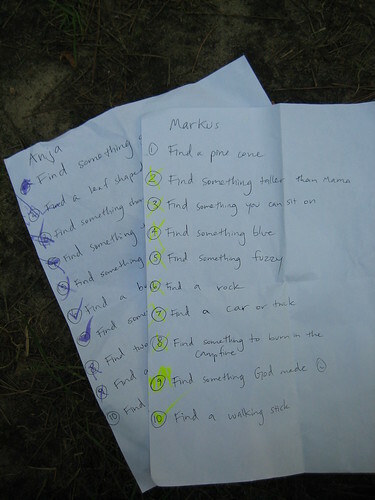 Here are some of the things we did/learned; hopefully they can be useful to others planning to do this with small ones. Our kids are 2 1/2 and 4 1/2, if that is helpful to know. Go somewhere near home. If there are storms or noisy fellow campers (see next tip), you won’t feel like you have to stay and tough it out. We were within 20 minutes of our home and knew we could skidaddle in a moment’s notice if needed. As the kids get older we’ll probably venture further out, but staying close while they are young gives us peace of mind. 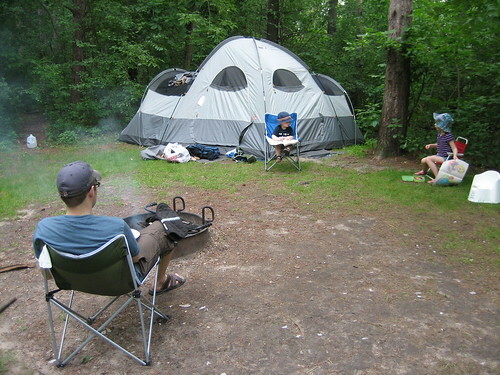 Check the location of your campsite in relation to others before booking. We booked a walk-in site that was fairly private, but what we didn’t know was that it was also very near a group campsite. There were a bunch of very loud, drunk 20-somethings within a couple hundred feet of us that kept the kids awake until after midnight the first night. None of us were happy about that. Next time I’ll make sure to look at the full map, not just the one of our site area. Bring lots of snacks. 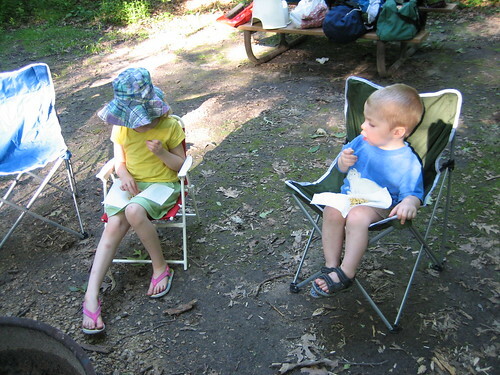 There were times when dinner was cooking (and it’s hard to know how long it will take sometimes to get the fire just right), and the kids were hungry. We were able to pull out a granola bar or fruit or trail mix and water bottles, and they made it to mealtime without getting crabby. Eating trail mix while we unpacked the car and set up. Stock up on glow-in-the-dark stuff. 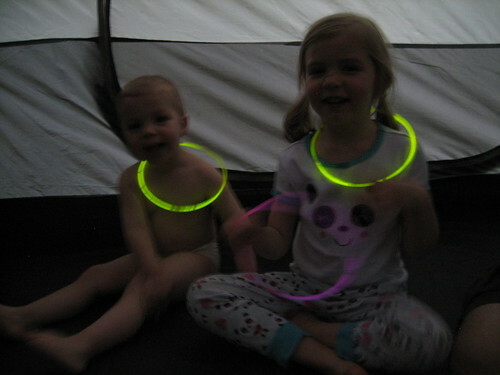 I brought glow sticks/glow bracelets/flashing toys from the dollar store and their toy bin. They enjoyed playing with them a ton, plus it helped us keep an eye on where they were. Go to a campsite that has a park. It wasn’t right near where we were camping, but within a half mile walk. 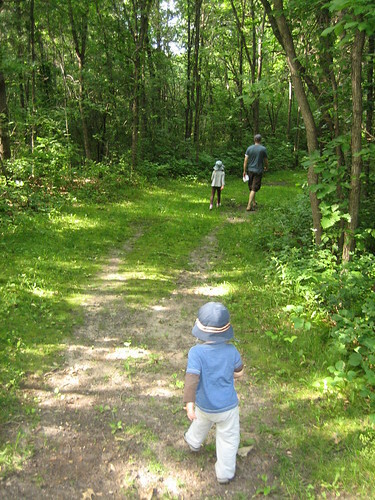 We took the kids there one morning to play. 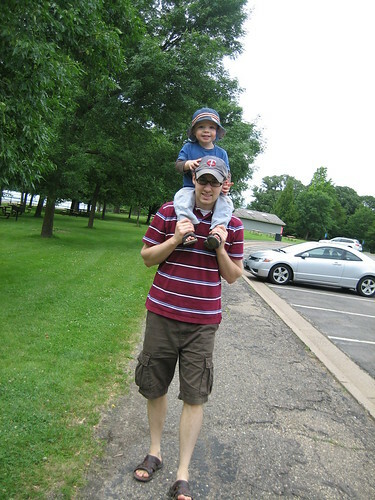 If you have room, bring an all-terrain stroller (we didn’t have room). 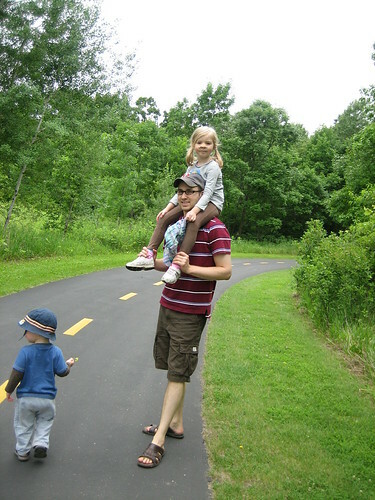 Husband was fine with carrying the kids on his shoulders in turn, and we had paved trails which worked great for our umbrella stroller, but if we’d planned on doing any long walks, Markus wouldn’t have made it with his short little legs! Do a lot of your cooking in advance. We had these excellent Campurritos, pre-marinated fajitas that just had to be heated in a grill basket, hobo dinners, and pancakes, all which were made in advance, stuck in the cooler, and just had to be pulled out and cooked at the site. 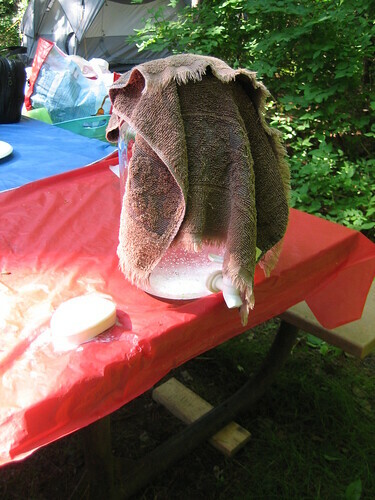 Most of them were in heavy duty foil that we just stuck in the coals (wood), and the pancake batter I kept in two separate bags–wet and dry, then mixed the two and shook it up, cut off a corner of the batter bag and squeezed it into the pan. Easy peasy! 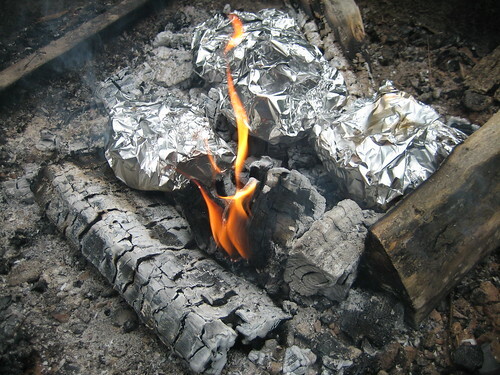 And hobo dinners are basically a hunk of hamburger, some spices, onions, potatoes, and veggies (I used carrots and green beans) wrapped in foil and tossed in the coals to cook, too. Tongs were helpful to have along to rotate the foil packets. Since I didn’t have to spend a lot of time doing meal prep or clean-up, I was able to engage with the kids and even have some time reading in the tent during nap time! 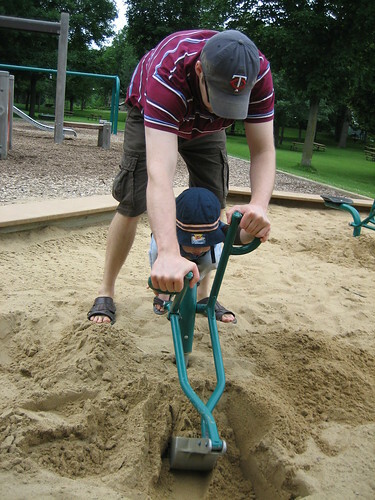 Plan activities for the kids. I had about 10 different activities at the ready: play dough, coloring, the glow sticks, scavenger hunt, bubbles, hiking, playground, paper boats, leaf/nature rubbings, singing around the fire, ghost stories, board games. We only ended up using about half, but it was nice to know we had things to fall back on. Make your own hand-washing station. 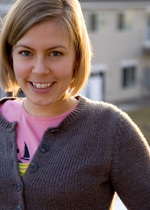 I read this in the comments on someone’s blog, and it proved to be a very valuable tip! We put this jug at the end of our picnic table along with a bar of soap and a towel and we didn’t have to use hand sanitizer (which neither husband nor I like) all weekend. 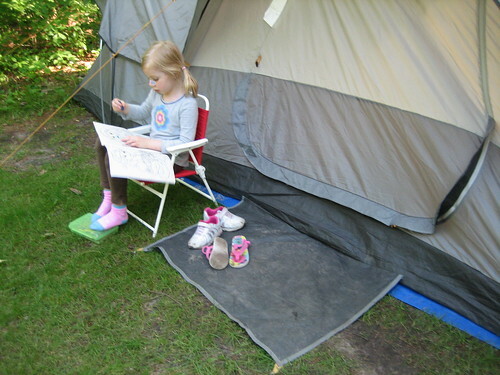 So, what are your favorite camping-with-children tips? We enjoyed ourselves and wouldn’t mind going again sometime, and I love learning from others! Sidenote: For anyone wondering what happened to Anja’s nose, she tripped over the fan in her room last week during a power outage and split open the bridge of her nose. It was terrifying to be in the dark, not knowing what had happened and trying to stop the blood (we’re still trying to get it out of the carpet). Ended up in the ER and got 12 stitches, including some sub-dermal. She was very brave and continues to handle it well.